1 8:07 Lots of turns and not sure what I had today. 3 8:24 Pretty much done. Tired. I am not sure exactly why I signed up for this race. 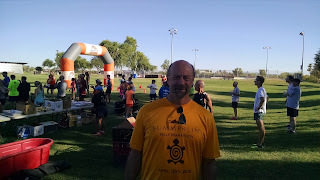 It was kind of "I am not doing anything on Sunday morning, so why not do a 5K" I sort of had buyer's remorse, but once I got to the race site, I was glad I had signed up for it. 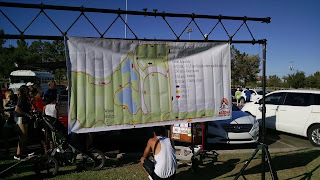 This race is the second in the Arizona Road Racers Summer Series -- I did race #1 two weeks ago at the Tempe Town Lake Trail. 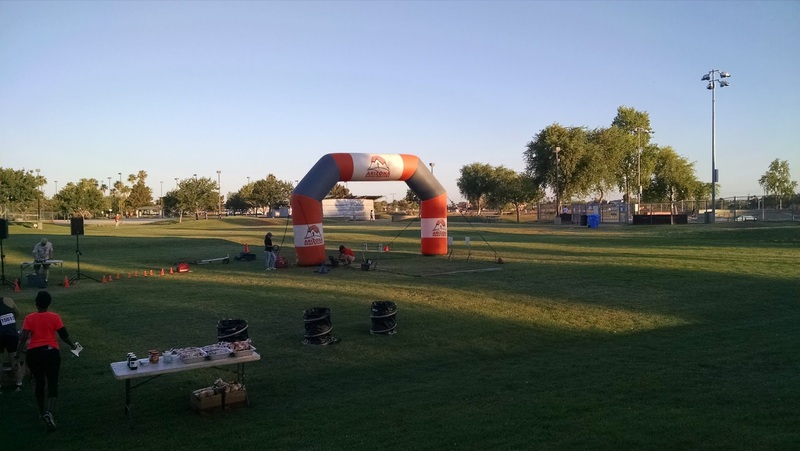 This race was held at Freestone Park in Gilbert. 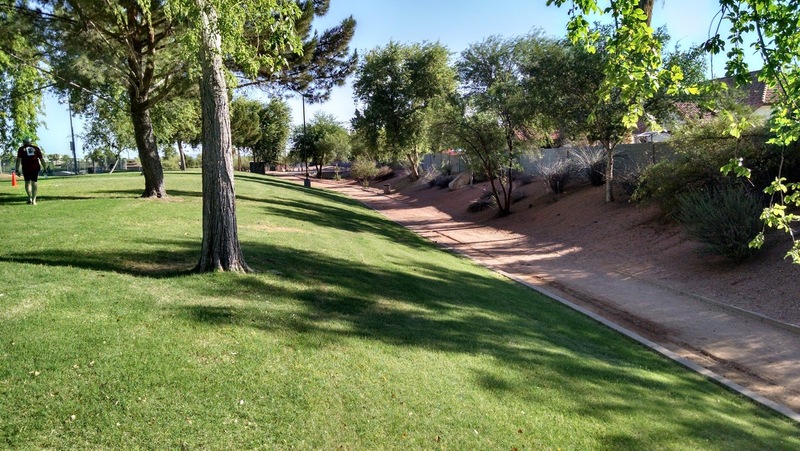 Faithful readers will recall that I did a 5K about a month ago at this park. I expected the same course as last time -- but I was for the most part wrong. I got to the race about 50 minutes early. I was one of the first there and it was easy getting my bib. I had registered for the race online, so I saved a few bucks. 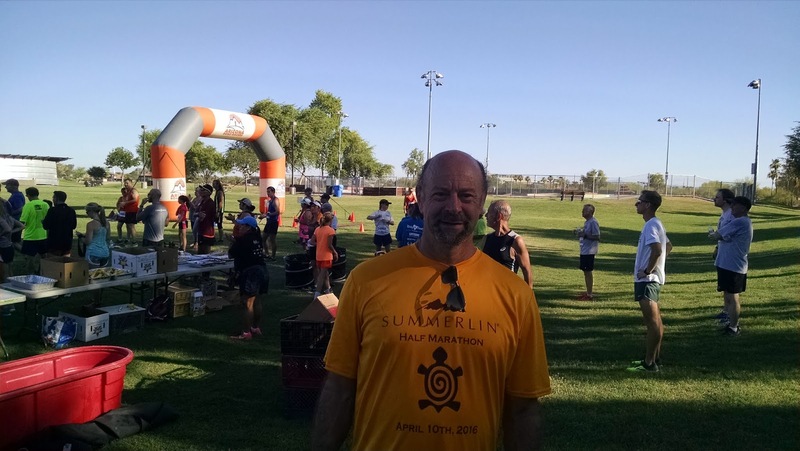 There wasn't any t-shirt on this race -- so a flat $25 plus the usual credit card fees got me into the race. I used the rest room a time or two and did a little bit a warm up. It was already pretty warm out so I kept my workout to a minimum. The race had over 350 runners and they did a fantastic job of making sure people were lined up in the appropriate spots. 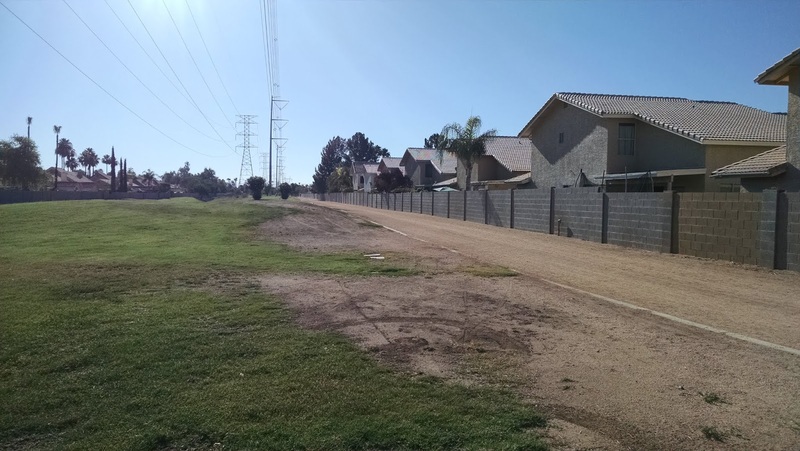 Since we were running on sidewalks or fairly narrow trails, it made sense and the race was chip timed. I started out with the third wave and I was able to get into my pace fairly quickly and without having to navigate around people who were in the wrong bracket. The first mile took us out of the park and onto the road briefly. There was minimal traffic and I didn't feel like I was in the way. We then jumped onto a running track that was crushed dirt. It had some uneven ruts in it, but it was easy to navigate. It was sort of heart breaking to pass by the starting line and know that I still had a good 2.5 miles of pain left. We then jumped onto a dusty track. I could see the lead runners flying ahead of me already coming back from their section of out and back. I wasn't doing too badly but my pace wasn't the greatest. 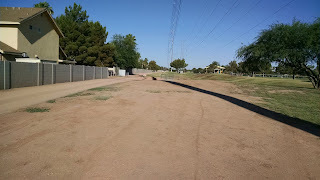 Also with all the runners on the canal trail, a cloud of red dirt hung in the air. While I didn't get any "bounce" from running, it was flat and I tried to dig deep along here. I was hoping to make up some ground on mile 2. Occasionally I'd get a burst of energy but for the most part my "A" game wasn't there. I was also sort of confused by the course. I had figured we'd be running the same one as the previous race I had done here. The course was well marked though and there was never a doubt as to where to go. Plus I was hanging with a variety of runners who were also 8-minute per mile runners. 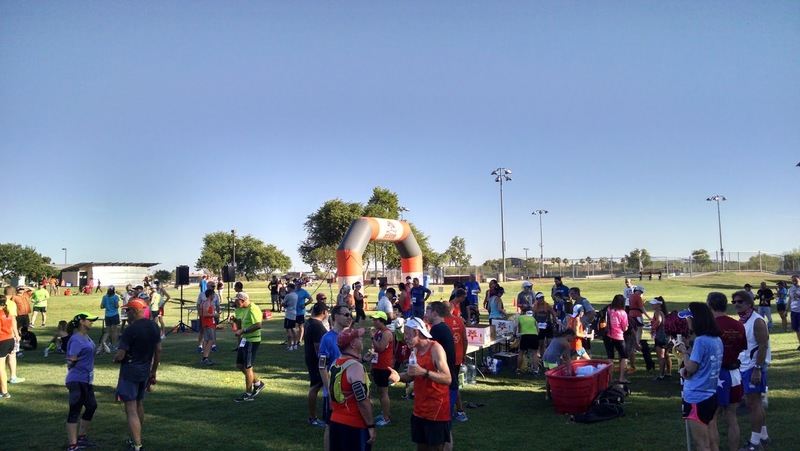 By the time I hit mile 2 I knew I wasn't going to have a super great race. I had hopes that things would come together and I'd be able to blast through the final mile, but it just wasn't there. The pain of the final mile of a 5K is always the toughest and my legs just wouldn't respond and it was just so warm. The last third of a mile involved a lot of turns, but I was so happy to finish this one. 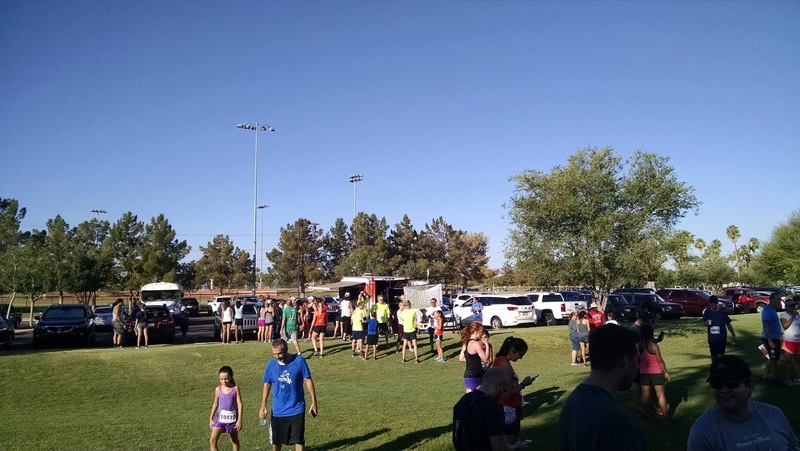 I talked to a few other runners and got various reports on how long the course was. I had a 3.09 and a 3.12. So I suspect the course was accurate (or I just run the tangents really well). I spent some time milling about the finish line and took in an apple and some banana slices. 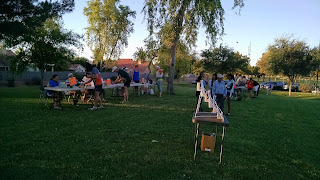 They had plenty of snacks -- cookies, bagels, sports drink, fruit and chips. I didn't have a lot on the agenda for the afternoon so I definitely soaked in the atmosphere. I am bummed that the t-shirt is extra. I have a zillion shirts so I really don't need one but I always like one as a memento. They handed out age group awards efficiently. Alas, unless I take a few minutes off my times I am not going to be in the running. My performance was about as expected today. It was warm (when I left, it was 91) and my legs were worn out from the previous day's run. None the less, I did a little bit better than expected. Despite my Garmin reporting a short course, I suspect it was accurate given the number of people who ran more than me. I liked the course. It was scenic and the turns made it sort of fun. However, it wasn't terribly fast and there were a few small hills. My Garmin didn't seem to record them, but overall it was well marked and kind of fun. I'll continue to do this race series if it fits into my schedule and I feel like doing something. If I was a contender, the series does have a payoff at the end, but for the rank-and-file runner there is not much there (not even a finisher medal for doing the entire series). 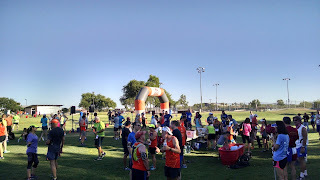 Still, it was fun and nice to socialize with the other runners.